In her Connecticut studio, Amy Kahn Russell handcrafts each necklace with a stunning, dichroic glass dragonfly pendant. The brilliant shades of orange that make up each dichroic glass pendant seem to dance like fire with every movement of the wearer. The unique iridescent dragonfly pendant is hand-set into brass and suspended from a gold-plated brass chain with carnelian and faceted quartz accents. 20 inches long with a 2 inch pendant and beaded lobster clasp. A limited edition of only 80 will ever be made. 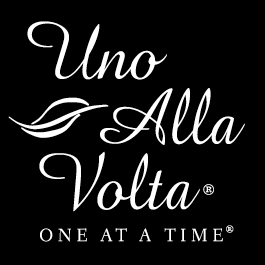 Handcrafted from the heart and hands of the artisan exclusively for Uno Alla Volta. Amy has been delighting Uno Alla Volta customers since our company's founding in 2003. She travels the world in search of treasures and then brings them back to her Connecticut workshop, where she transforms these exotic finds into limited edition jewelry pieces.